Toronto Domestic Violence And Assault Lawyer. Family violence is a very serious problem. Domestic abuse can cause untold damage to a family, to spouses and to children. If you are a victim of family violence, the police should be involved. Restraining orders or Peace Bonds are issued by the court to prevent people from contacting those they may want to harm. They are sometimes called “no-contact” orders. A Peace Bond is issued by a Justice of the Peace if there have been threats or acts of violence to property or persons. It’s not a criminal charge, but breaching a Peace Bond is an offense. A restraining order issued in Family Court, only applies to spouses and ex-spouses, and is usually part of a larger proceeding. Unfortunately, sometimes charges of domestic abuse can become part of a separation process when they should not be. Sometimes allegations of abuse are used to get a spouse out of the marital home. Sometimes during a fight, if the police are called, they will charge one of the spouses even if there has been no violence, because there have been threats or alleged threats. This can turn into a very difficult situation for both spouses, because in Ontario police are not allowed to withdraw charges even if the alleged victim withdraws his or her statements regarding threats or abuse. Spouses who change their minds about their charges may even face charges for making false statements to the police. This entire process can cost a great deal of money and harm a person’s reputation. Our Toronto domestic violence and assault lawyer can help you manage your family affairs in the face of these charges, and can help you understand how criminal charges are likely to affect other issues in a separation such as custody and access. Looking for a Toronto Domestic Violence And Assault Lawyer? 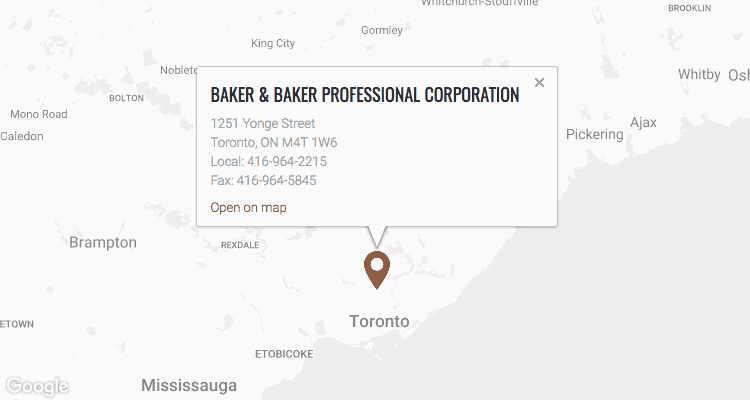 If you are a victim of family violence or have been accused of partner assault, contact Baker & Baker at 416-964-2215 or by email. We can help you decide what to do about the charges, how to work with the courts or with each other to resolve the situation, and get your life back to normal.